Fresh figs are remarkably fragile (ripe ones often split open with juicy goodness even when left completely alone!). For that reason, local figs are often the only fresh figs a person can buy without edging into the world of wilted, semi-spoiled specimens, or, just as bad, fruit picked before it's ripe. And yet, finding locally grown figs can be tricky outside of California, even though they can be grown anywhere with winter temperatures that don't drop below 20°F (learn more at All About Figs). 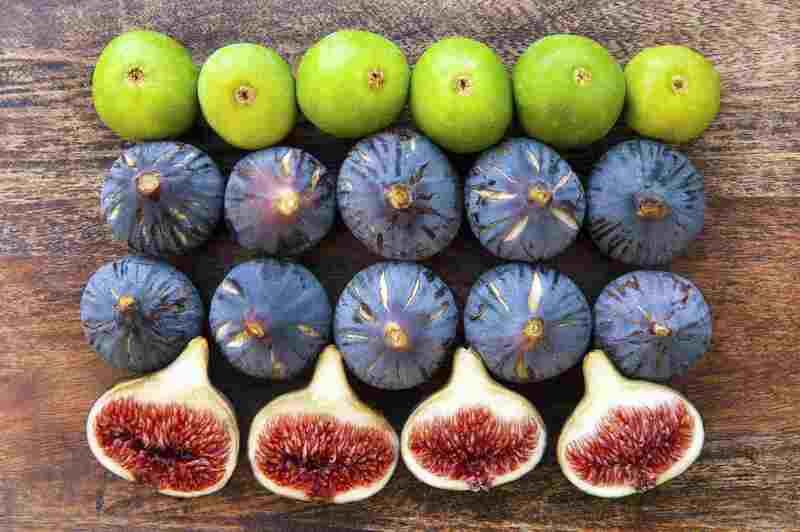 So good luck, beware and keep your eyes open for the five most common varieties of figs (listed here) at markets near you. Already have figs? See these 10 Quick Fig Recipes to make the most of them. These pale green to pale yellow figs are sometimes called "white figs" for their light color, and in a bright sunshine they really can take on a white-ish hue. You may also see them sold as "candy-striped figs," so named when their exteriors are pale green-and-white striped. Pretty as they are on the outside, it's their bright pink to brilliant red insides that win all the attention and provide their extra-sweet-even-for-figs flavor. Adriatic figs are harvested in June and again in August. Their super sweet nature means they work particularly well as a simple fruit dessert all on their own. If you need to jazz them up, serve them with a dollop of creme fraiche or mascarpone cheese. They are also delicious sliced or chopped served on ice cream or plain, unsweetened yogurt. If you can get your hands on sheep milk yogurt, all the better. Black Mission figs are extremely sweet (sometimes they even ooze a bit of syrup, which you should take as a very good sign when picking or buying them). Despite their name, they aren't really black—more of an insanely deep blue-purple that is gorgeous in its own right. Inside they are beautifully pink. Their dark exteriors make any wilted or puckering from being less-than-fresh quite obvious, making it all the easier to find perfectly ripe specimens. Their insane sweetness makes them perfect for serving plain or with yogurt or tangy fresh cheese (such as mascarpone, fresh ricotta, fromage blanc, or farmers cheese) for dessert. Also try them whole or halved on cheese platters, chopped and put on crostini, or sliced and layered into fresh fruit tarts. Brown Turkey figs have brownish-dark purple skin, a milder flavor than other figs, and are noticeably less sweet than the similar-looking Black Mission figs. Inside, they tend to be a paler pink than other figs. Brown Turkey figs work well in salads, where their lighter sweetness is a welcome contrast, or in desserts where an additional sweetener will be used. If all you have are brown turkeys and you want dessert, drizzle them with honey and run them under the broiler for a moment until the sizzle and bubble, or use them to make fig bread. Or, you can always use them to make fig jam. Calimyrna figs are large compared to other figs, and have greenish, slightly golden skin. They have striking pink insides that are made more striking by the contrast with their exteriors. Because of their stunning interiors, Calimyras are a great option just to cut up and serve as-is. They have a distinctive nutty flavor. All figs have that nuttiness, of course, which is why they're so good with nuts, but this variety has a stronger sense of nut about them. Because of their nutty side, they also make a pretty addition to relish trays, as well as cheese or charcuterie platters. Or set them on a grill for a beyond-easy dessert. Kadota figs have light green skin with pale interiors that are less sweet than other figs. Kadota figs good raw. They are not the best, sweetest figs raw, but they're fine, and if they're the only figs at hand they'll be fabulous! ), but take very well to being heated up with something else and are good candidates for making jams and preserves. If you have a batch of particularly not-super-sweet Kadotas, hit them with just the barest amount of salt to bring out their sweetness—it's not for everyone, but for those who like a salty-sweet vibe, it's pretty darn good. It's why they are an exceptionally good option to add to salads (chop them up and toss them with the dressing before adding the greens or other ingredients) and to use on fig and arugula pizza.